There are many great choices for a weekend get-away in Ohio. Ohio has a number of exciting theme parks, museums, professional sports events, and many ideal two-day adventures. Whether you are looking for a relaxing solo retreat from the daily grind, a romantic weekend rendezvous, or an outing for the entire family, you will be able to find exactly what you are looking for in Ohio. What would be more enjoyable than a weekend get-away to one of Ohio's theme parks? 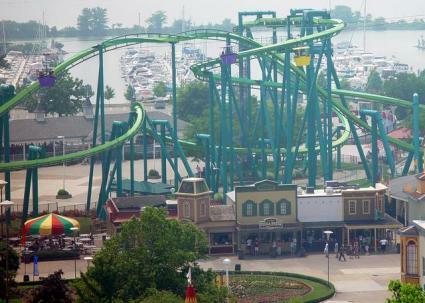 The world's largest amusement park, Cedar Point, is located in Sandusky, Ohio. The thrill seekers in your party will delight in the park's 14 roller coasters and thrill rides. There are also less spine-tingling options for those who aren't into quite so much excitement. Cedar Point has carousels, paddlewheel excursions, a sky ride, children's rides, and much more. Visitors to Cedar Point can also enjoy the park's shows, beach, petting farm, museum, beautiful landscaping, and delicious food. Park visitors can choose to stay on site at one of the Cedar Point Resort facilities. These upscale resorts feature a number of amenities, and guests are even able to gain entry to the park an hour before the general public. For more information on planning your Cedar point get-away, visit the Cedar Point website. Just north of Cincinnati you will find King's Island amusement park, which features more than 80 rides and attractions. One of the park's most unique attractions is "Son of the Beast", the only looping roller coaster in existence that also happens to be the longest and fastest of its type. The park has a total of 13 roller coasters, which will excite the daring in your group. King's Island is a terrific spot for children. Featuring Nickelodeon Universe, it includes 18 rides and attractions just for youngsters. Those who love the water will also adore passing the time during their weekend getaway at the park's Australian themed water park, Crocodile Dundee's Boomerang Bay. Additionally, many area hotels offer special weekend packages. For more information, check out the King's Island website. You don't have to go all the way to New York to experience Coney Island! Cincinnati is home to the Coney Island Theme Park, the modern-day descendent of Ohio Grove, The Coney Island of the West, which opened in the same spot in 1886. Visitors to the park today can enjoy more than fifty different amusement rides and attractions. Some of the most popular rides at Coney Island Park include the Python Roller Coaster, the Scream Machine, a 40 foot Ferris wheel overlooking Lake Como, bumper and pedal boats, and many additional choices. One of the most popular attractions at Coney Island Park is the Sunlite Pool, which is the world's largest re-circulating swimming pool. For those who would like to make a habit of enjoying a weekend get-away in Ohio at Coney Island Park, individual and family season passes are available. See the Coney Island Park website to learn more about the park's many attractions. While Ohio does in fact have an assortment of theme parks, there is much more to the state than just roller coasters and water parks. There are a number of different types of Ohio attractions that make ideal weekend escapes. Cleveland is home to the Rock and Roll Hall of Fame and Museum, which features exhibits dedicated to the history, present, and future of rock and roll music. When you visit the museum, you'll be able to view displays featuring the evolution of rock and roll from its beginnings until current day. There are also a number of exhibits that explore the work of some of the legends of rock and roll, such as the Beatles, Elvis, the Rolling Stones, and many others. For up to date information on the latest events, see the museum's website. If you time your weekend get-away in Ohio just right, you can include attending a professional sporting event in your itinerary. During the fall, Sundays mean football for fans of the Cincinnati Bengals and the Cleveland Browns. Saturdays are game days for the Ohio State University Buckeyes. Baseball fans can catch the Cleveland Indians throughout the summer months. NASCAR fans can take in a race at Mansfield Motorpark throughout the racing season. Ohio offers many of great hotel and lodging accommodations. Whether you are looking for a romatci bed and breakfast, an upscale luxury hotel, or an affordable family-oriented motel, you can find a variety of choices for your weekend trip. Visit the Ohio Hotel and Lodging Association to search for accommodations in the area you wish to visit.